Jaxon Drills High Grade Silver-zinc at Hazelton, Expands System | Jaxon Mining Inc.
Jaxon Mining Inc. (TSXV: JAX, FSE: OU31, OTC: JXMNF) is pleased to announce assay results from 2,281 metres of diamond drilling in 12 exploratory drill holes completed in December 2017 on the Max silver-zinc target at the Hazelton Project, located 50 kilometres north of Smithers, B.C. All drill holes intercepted sulphide mineralization indicating widespread distribution of mineralization describing a robust system. 11 discrete intervals of high-grade silver (over 100g/t Ag) were intercepted in 7 of 12 holes drilled. These intercepts occur as antimony-rich silver sulphosalts in polymetallic veins, feeder breccias and stratiform beds, returning grades from 103 g/t to 1,206 g/t silver, up to 11.1% zinc and up to 2.07 g/t gold. The multiple-phase overprinting of polymetallic sulphide-sulphosalt mineralization is suggestive of a large and long-lived shallow-marine volcanogenic massive sulphide (VMS) system in this portion of the volcanic-sedimentary Rocky Ridge sequence. Carl Swensson, Jaxon's VP Exploration, stated: "We've ticked all the boxes with this first pass drilling on the Max target. The drill results, as modeled, indicate that we're in a large mineralized volcanogenic system. It's evident that the system carries high grades of precious and base metals, and, importantly, we're beginning to understand its diagnostic signature at depth." Jason Cubitt, Jaxon's President, added: "We'll be able to build on what we're seeing here. The next task for us is to add this drill data to our conceptual model, locate the boundaries of this large mineralized system, and vector to the areas where the highest grade mineralization is structurally controlled." A total of 2,281 metres were drilled at the Max target in 12 holes, and 1,019 core samples were selected for assay. The drilling targeted modeled high chargeability and low resistivity locations from the ground-based 2D and 3D induced polarization (IP) survey. 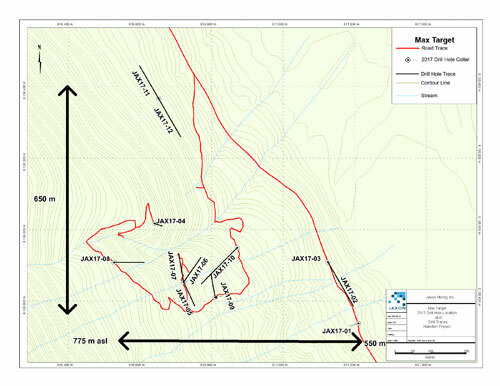 The 12 completed drill holes tested a roughly one-square kilometre area at the Max target along the northeastern slope of Blunt Mountain, from elevations of 550m to 775m, coincident with the channel sampling completed in the summer of 2017. This drill zone at Max only represents 0.2% of the area of the Hazelton Project, which covers a contiguous 47,000 hectares. Drilling confirmed the diagnostic signature (antimony) of a precious metal rich shallow marine VMS system. 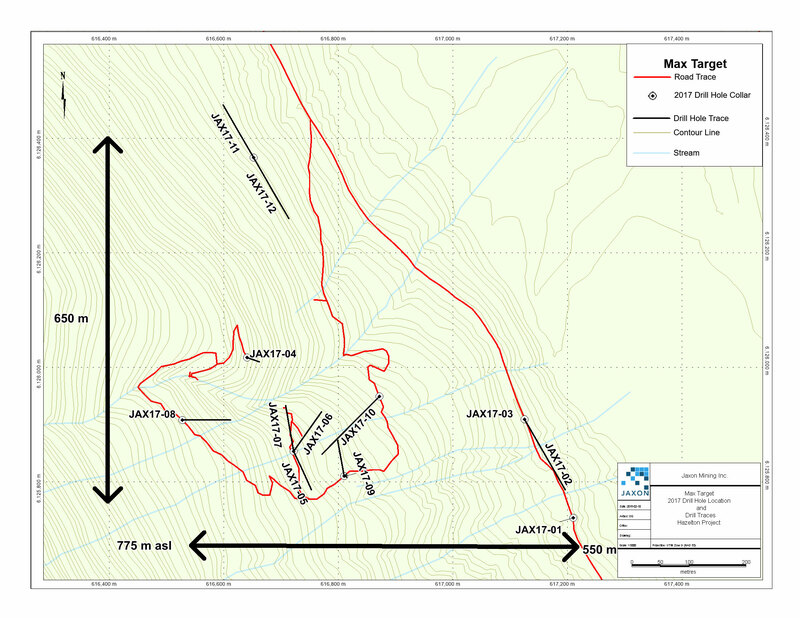 The Max target displays characteristics of the nearby Equity Silver Mine (once Canada's most profitable silver mine) including similar age rock, shallow marine setting, and possible remobilization of precious metal rich mineralization. Polymetallic sulphides with variable presence of sulphosalts were found in rhyolite and tuffs, monzonite, and in marine sediments such as argillite and arenite. Variable quantities of semi-massive to massive stratiform-bedding parallel sulphides, cross cutting veins, and fractures have been found in all lithologies. It is evident that the IP survey responses tracked sulphides. No evidence of folding or major structural disruptions or faults was observed. Due to the success of blind IP targeting, particularly in drill holes 17-11 and 17-12, Jaxon has made preliminary plans for an additional 1,000 – 4,000 metres of drilling at the Max zone in the coming 2018 field season. This drilling will also cover the area directly adjacent to the north of the known mineralized Max target, where a magnetic low (potentially due to hydrothermal alteration) is coincident with high chargeability targets. Jaxon's technical team and consultants continue to assess data from the 2017 field program and detailed plans for proposed work in 2018 at the Max target, as well as other highly prospective gold, silver and non-ferrous metals targets on the Hazelton Project, will be provided by separate press release. All core was transported daily to Jaxon's secure core logging/cutting facility in Smithers. The core was logged by a professional geologist and selectively sampled. The selected core sections were cut in half with one half placed back in the core box, and the other half prepared for shipment for analysis assay. The core sample lengths were generally one-metre displaying mineralized massive sulphide sections varying from 0.2m to 0.5m in length. All samples were packed in rice sacks, sealed, palettized, and securely shipped to MS Analytical Laboratories in Langley (ISO/IEC 17025:2005 certified), B.C. to undergo analysis. The analyses included; ore grade poly metallics Code ICP-240 for Lead, Antimony, and Zinc in percent. Gold underwent 20g Aqua Regia ICP-AES-MS Code IMS-117, silver fire assay of a 30g Gravimetric Fusion Code FAS-418 was used to obtain the value of 1,206 g/t silver. Jaxon retains the remaining core samples in numbered core boxes stacked in a secure gated storage facility. Jaxon conducted its own independent QA/QC program for the drill program inserting quality control samples - 1 in every 10 samples. This included the insertion of certified standards with 3 standards having silver contents in the high-grade range of the Max mineralized samples. Jaxon also inserted blanks and limited duplicate samples. These samples are checked to ensure results fall within acceptable target ranges and all results from the controls were acceptable.